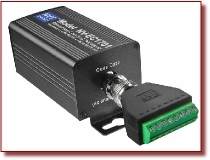 Network Video Technologies (NVT), has released a new Ethernet over 2-Wire transmission device. Designed to deliver 10/100/PoE Ethernet over UTP, STP, or 18/2 wire, the new NV-EC1701U supports IP-based video, intercom, access control, or any other Ethernet application. A compact media converter, the NV-EC1701U Ethernet over 2-Wire Eo2TM Transceiver allows 10/100 BaseT Ethernet and PoE power to be transmitted up to 305m (1,000ft), using new or existing 2-Wire cable. One NVT Eo2TM transceiver at the network-end can support up to four remote Eo2 transceivers and their connected IP network devices. Quick to install, simple to use, and network transparent (with no PC configuration required), the NV-EC1701U features 128-bit AES encrypted transmission technology and built-in transient protection. Camera loads of up to 45 watts are supported, with 48VDC class 2 power at one transceiver being delivered through the cable to up to four remote transceivers, and their IP/PoE cameras (or other devices). As with all NVT products, the NV-EC1701U is covered by a limited lifetime warranty, and backed by NVT's award winning customer service.